Rallying for Reform | News and Features | Style Weekly - Richmond, VA local news, arts, and events. Thousands join student-led March for Our Lives in support of stricter gun laws. Scott Elmquist Students marching through the city to the Capitol on Saturday, March 24. Against the backdrop of Mosby Court, a public housing neighborhood where two teenage boys were shot earlier this month, thousands of people mill around in front of Martin Luther King Jr. Middle School Saturday morning. It's just before the start of the Richmond March for Our Lives. High school students, young children and families carry signs with phrases like “There should be a background check before the NRA is allowed to buy a senator” and “ Kids are not bullet-proof and you are not ballot-proof.” Volunteers with clipboards remind attendees to register to vote, and representatives of the Coalition to Stop Gun Violence hand out round stickers featuring an assault rifle crossed out in red. This isn’t Marie Stella’s first rodeo. The 74-year-old Chesterfield resident marched with Martin Luther King, Jr. in the 1960s, participated in sit-ins protesting the Vietnam War, and traveled to the nation’s capitol last year for the women’s march. And as motivated and inspired as she is by the students behind the movement for gun reform, she says it’s disheartening that young people have to step up. Before the march to the Capitol begins, organizers, students and politicians take the stage atop a bus to address the rapidly growing crowd. One of the first speakers is Richmond Public Schools Superintendent Jason Kamras. Virginia Senator Tim Kaine and Richmond Mayor Levar Stoney also scale the ladder and deliver impassioned speeches. Both politicians give high school students the credit for organizing the march and leading the gun reform movement. Kaine goes on to note the news that Citibank, one of the largest financial institutions in the country, is now limiting their business interactions with gun manufacturers. “They never did that before high schoolers got involved,” he says. Short Pump resident Cortney Carroll was near the stage at the Oct. 1, 2017 Jason Aldean concert in Las Vegas when a gunman killed 58 people in the largest mass shooting in American history. 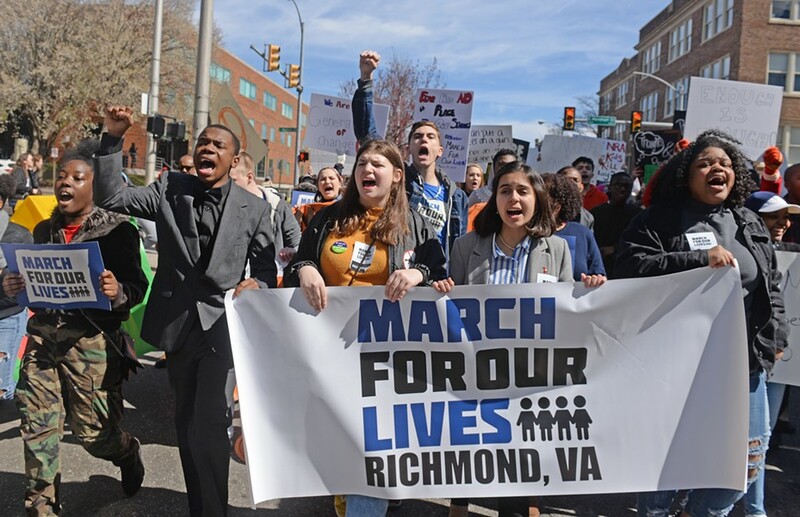 Since then, she has spoken in support of gun reform legislation at the 2018 General Assembly session, attended her first concert since the shooting and participated in Richmond's March For Our Lives on Saturday, March 24. A day after the march, Carroll sat down to discuss what the march was like for her, as she wore a Route 91 Survivor sign. Video by Charlotte Woods. Among the local students to speak before the march is Chaz Nuttycombe, a senior at Hanover High School in Mechanicsville. After about an hour’s worth of speakers, energetic marchers take to the sidewalk, ready to walk from the school, across the Martin Luther King Jr. Memorial Bridge, to the bell tower in Capitol Square. Senator Kaine blends in with the crowd for the mile-long march and answers a few questions along the way. A Richmond native who was Governor of Virginia in 2007 when 32 students and faculty died in the April 16 shooting at Virginia Tech, Kaine describes a longtime partisan battle for gun reform. But the issue hasn’t always been so divided by party lines. Kaine says he recently spoke with former Virginia Senator John Warner, a Republican who co-sponsored the Federal Assault Weapons Ban of 1994. Bipartisanship existed in the ‘90s, he says, but it’s different now. Some of his Republican colleagues have implied that if Congress does “a few things, maybe they’ll go away,” but Kaine doesn’t think the student-led movement will back down any time soon. At the end of the march, which culminated in front of the State Capitol building, Community High School students Ariana Shahidi and Alvaro Jimenez are inspired and energized. Her friend Jimenez, also 17, won’t be voting in November — but that’s because he’s from Spain, visiting the U.S. as a foreign exchange student for the school year. “In Spain there’s no gun culture, because there are no guns,” he says. Jimenez envisions a future in this country. And even though he didn’t grow up practicing active-shooter drills in the classroom, he didn’t think twice about getting involved in the student-led movement.